“Cuban officials are reportedly convulsed in guffaws very similar to their guffaws in response to the request by Obama officials for the return of some of the FBI’s most-wanted criminals who live like celebrities in Cuba. The hilarity displayed by Cuban officials in the face of sweating Obama administration officials reportedly also caused spittle to actually splatter the shaken U.S. officials when they meekly inquired about the return of the $7 billion Castro stole at Soviet gunpoint from U.S. citizens in 1960. “All of this hilarity and truculence by Cuban officials in the face of Obama’s officials comes despite the flood of U.S. dollars to Cuba resulting from Obama’s recent “rapprochement” with the Castro regime. This U.S. economic lifeline was estimated at over $5 billion last year-- which amounts to more than what the Soviets pumped into Castro’s fiefdom annually at the height of their sponsorship. Ok, Ok, the WSJ story obviously didn’t contain the second, third and fourth paragraphs above. But any semi-sane Cuba-watcher can easily visualize the incident. The formerly missing missile, known as a Hellfire is a laser-guided, air-to-surface missile often fired from Apache attack helicopters and Predator Drones and has become “ an important part of the U.S. government’s antiterrorism arsenal,” according to the WSJ. In other words, it’s a hot item to get their hands for everyone from ISIS to Iran and from Syria to the Taliban. Retired Lt. Col. Chris Simmons helped uncover 14 Cuban spies, including Castro’s master-spy Ana Belen Montes, who today serves a 25 year prison sentence after conviction in 2002 for the deepest and most damaging penetration of the U.S. Defense Department in modern history. In brief, Simmons knows what he’s talking about. But here’s what really galls: as early as June 2014 U.S. officials learned that the terror-sponsoring Castro brothers had hold of our missile. 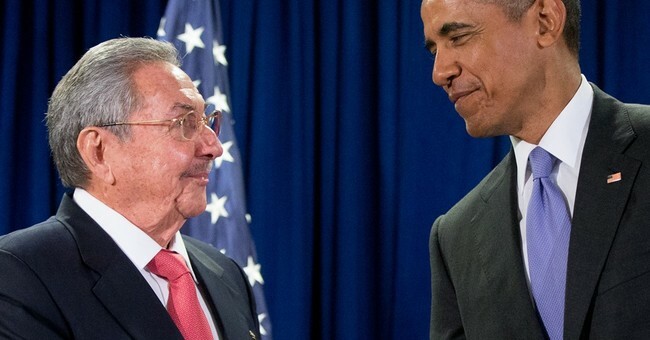 Obama’s officials were in hush-hush “negotiations” with Castro’s KGB-trained apparatchiks at that very time. And as mentioned, those “negotiations” possibly saved the Castro regime from bankruptcy. And yet not only does the missile remain in Cuba—but Obama also removed Cuba from the State Department’s official list of terror sponsors!.... “The Art of the Deal”—INDEED!